When Dr. Peter Libby, chief of cardiovascular medicine at Brigham and Women’s Hospital in Boston, talks to his patients about heart disease, he often has to start by disabusing them of a popular misconception. 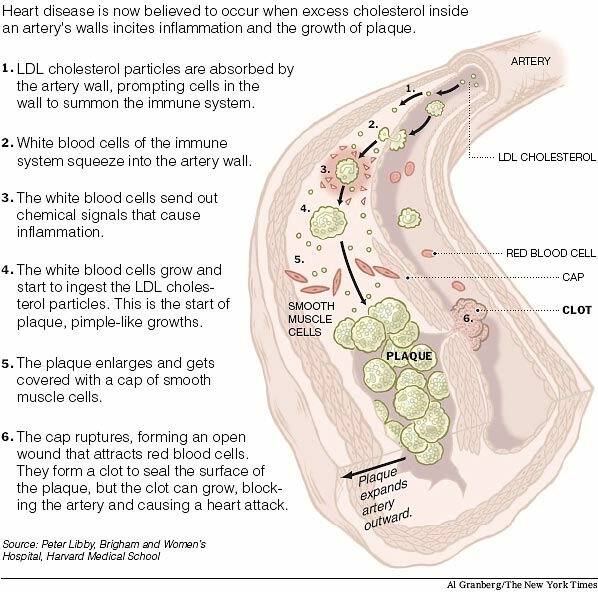 Most think cholesterol silts into arteries, blocking them like a clogged pipe. When, one day, an artery gets completely blocked, a heart attack occurs — no blood is getting through to the heart. But the plumbing image is not only mistaken, cardiologists say. It can also lead patients to make disastrous errors in trying to protect themselves from a heart attack. Plaque is actually a pimple-like growth inside an artery wall. The pimples, stuffed with what Dr. Libby describes as a “kind of chronic pus,” usually grow outward so they do not obstruct the blood vessel for many years. But once plaque gets started, Dr. Libby says, it covers the walls of the arteries. “It’s likely that no part of the artery is normal,” he adds. Arteries removed during autopsies of heart attack patients tell the story. “There are all kind of plaques, cheek by jowl,” Dr. Libby says. There is the large, ugly yellow plaque that led to the heart attack. It popped open one day, attracting red blood cells that formed a clot on its surface, blocking the artery. There also are grayish-white plaques, old ulcerated plaques that became calcified. There is so-called vulnerable plaque, the pustules that are ready to burst. And there are yellowish streaks, thought to be plaques starting to develop. Patients typically have dozens of vulnerable plaques, and it is impossible to know which will burst and which of those will result in a blood clot that blocks an artery. “From 100 plaque ruptures, it is only one that causes a heart attack,” said Dr. Valentin Fuster, a professor of cardiology at Mount Sinai School of Medicine in New York. The only thing proven to reduce the risk of a heart attack in someone with vulnerable plaque is the same thing that works to prevent vulnerable plaque from developing in the first place — controlling cholesterol levels, blood pressure and blood sugar and not smoking. Excess cholesterol gets stuck in artery walls. The wall becomes inflamed with white blood cells of the immune system. Those white blood cells in turn spew out highly active molecules that change the biology of the artery wall, leading to plaque. With high blood pressure, the very molecules, angiotensin II, that raise blood pressure also bring the release of the damaging small molecules that inflame arteries and set off the growth of plaque. Smoking, Dr. Libby added, appears to cause heart attacks for a different reason: it makes blood more likely to clot. And it turns out that controlling these humdrum risk factors can nearly prevent heart attacks, said Dr. Daniel Levy, director of the Framingham Study, a federal study of heart disease in the population of Framingham, Mass. Dr. Levy explains: Suppose a 50-year-old man does not have diabetes and does not smoke and keeps his cholesterol and blood pressure in the range recommended by national guidelines. Over the next 45 years, his chance of ever having a heart attack or symptoms of heart disease, like chest pain, is just 5 percent. The same goes for a 50-year-old woman with those risk factors under control. Her chance of symptomatic heart disease is 8 percent, slightly higher than the man’s because women live longer. But only 5 percent of 50-year-olds have those risk factors under control. And give that man just one major risk factor, for example a high cholesterol level, and his chance of having symptomatic heart disease rises to 50 percent. The woman’s chance rises to 39 percent. Only a third of people with high blood pressure have it under control, Dr. Levy said, even though there are dozens of effective drugs. Dr. Levy thinks he understands why these prevention strategies are given such short shrift. Prevention, he says, “does not have a face.” There are no personal stories, no individuals who can be pointed to as the success of prevention. It is just statistics.